At the sale’s conclusion $122,235,500 had been traded, making it the second-best Easter Sale ever behind only the 2008 phenomenon. *A total of 19 lots realised $1m or more, purchased by 13 different buying groups and represented by 11 different sires (Snitzel, Fastnet Rock, Deep Impact, Exceed And Excel, I Am Invincible, Lonhro, Redoute’s Choice, Not A Single Doubt, Zoustar, Pierro and Brazen Beau). Today’s top lot doubled as Tyreel’s first $1m yearling, an Exceed And Excel x Written Dash colt (lot 337) they offered which Aquis Farm purchased for $1,700,000 (pictured). “He was an exceptional yearling and the busiest horse we have ever presented at the sales, people were just coming back day after day to come and see him,” Tyreel’s Linda Monds said. “He was high on everyone’s list, he looked like a fast, sharp, running Exceed to me. The colt was one of 13 outright acquisitions for Aquis which resulted in them being the sale’s leading buyer by both lots purchased and aggregate ($8,375,000), while they also purchased five in partnership. “We didn’t have a specific target in terms of numbers, we just wanted to come here and secure some nice horses,’’ McGrath said. The sale’s overall leading vendor was Arrowfield Stud, whose principal John Messara described it as “a great sale’’. 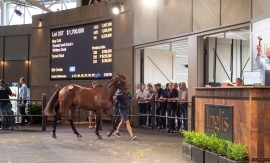 Inglis Managing Director Mark Webster believed the results of the past two days again showed vendors and breeders where their best yearlings should be sent for sale. “Inglis Easter is the best place to sell your best yearlings. That has been proven yet again,’’ Webster said. “I’m extremely proud of my team for collating the right catalogue and then collating a strong and diverse buying bench which saw buyers come from Asia, the UAE, UK, USA and of course Australia and New Zealand purchase yearlings. To view our Inglis TV story on Chris and Jane Barham’s remarkable journey to the top of the breeding game, CLICK HERE. To view our Inglis TV story on Redoute’s Choice groom Jarryd Stennett, CLICK HERE. To view our Facebook Live review of Day 2 of the Easter Sale, CLICK HERE. To enquire on any passed in lot from the Easter Sale, contact Matt Scown on 0481 989 661. Buyers’ attention now turns to Oaklands for the Melbourne Gold Yearling Sale, which will take place on Sunday April 28. It is followed by a big few days of action at Riverside for the Chairman’s Sale (Friday evening, May 3) and the Australian Broodmare and Weanling Sale (May 2,5,6).